Attention authors: For many of you, writing the book is the easy part. The hard job starts after your book is published. These days, whether you are traditionally published or self-published, the task of marketing and promoting your book falls to…you. Marketing and promoting a book can be done in many ways. Press releases and platforms such as blogging, Twitter, Facebook, Linkedin, Google+…with new social media channels popping up every day…are the more passive – and possibly the avenues that introverted writers feel more comfortable in. Book events, interviews, workshops and other public speaking opportunities can be very effective…but often neglected by many authors…because of a fear of public speaking. Fear of public speaking is incredibly common, and not just in those with anxiety. Public speaking anxiety is one of the most common fears shared by most of the general population. Most people would rather go to the dentist rather than stand up and speak! Fear of public speaking is also known as Glossophobia. It comes from the fear of being judged. How to reduce public speaking anxiety? A little bit of anxiety as you prepare for a big speech or presentation is common. It is felt by even the best speakers in the world. Don’t expect yourself to be completely anxiety free. What you need is for that anxiety to help you give a great speech, not hold you back from speaking. You need to make smart decisions before, during, and after you speak. Practice your presentation…over and over again until you are almost sick of it – this helps you remember your speech and become more familiar with it. Now pretend you are giving your presentation in front of the audience. How do you feel…what are your exact fears? (1) That you will make a mistake? (2) That the audience is judging you? (3) That they will reject you or what you are saying? (4) That you will do or say something that embarrasses you? Will you fall into a deep black hole (for those who have a fear of public speaking, I think they wish they could fall into a deep black hole…I know I have)? Will they tar and feather you? Visualize the audience smiling and nodding their heads in agreement at what you are saying. How does that make you feel? I’ve done this step and it has truly helped me overcome a staggering fear of public speaking. When you walk on the street or stroll in a shopping mall, smile and say hi to everyone you pass. I do this when I visit my son and daughter-in-law in Chicago…my kids think I am crazy…but the faces of passersby light up and they smile back. As you stand in front of your audience, imagine these are the people you have greeted and they are so very pleased to have the opportunity to listen to you. On the day of the speech, try to be well rested, well hydrated and leave plenty of time to get where you need to be. During the speech: start strong and loud, looking around the room, but not focusing on anyone in particular. If you make a mistake, correct yourself and just keep going. Take a look at videos of famous speakers and speeches…lots of mistakes and stumbles! After the speech: Tell yourself what a great job you did! Make a list of the positives! Take note of one thing you would like to improve and work on it for the next time! During my first presentation at the Asian Festival of Children’s Content, there were several obstacles I had to overcome…the computer they provided was a Mac and my Power Point had been built on a PC. The clicker didn’t work and so one of the stage helpers had to advance the slides for me…but the computer was all the way on the other side of the stage – so I had to keep turning around to tell her when to do it. The venue was different from what I had been expecting – a huge open space instead of a smaller inside room. There had been a monsoon-type rainstorm about 30 minutes before my presentation and people were wandering in and out. Was I nervous? For sure! But I persevered and it went well. If I am lucky enough for them to invite me next year, I will make some improvements. 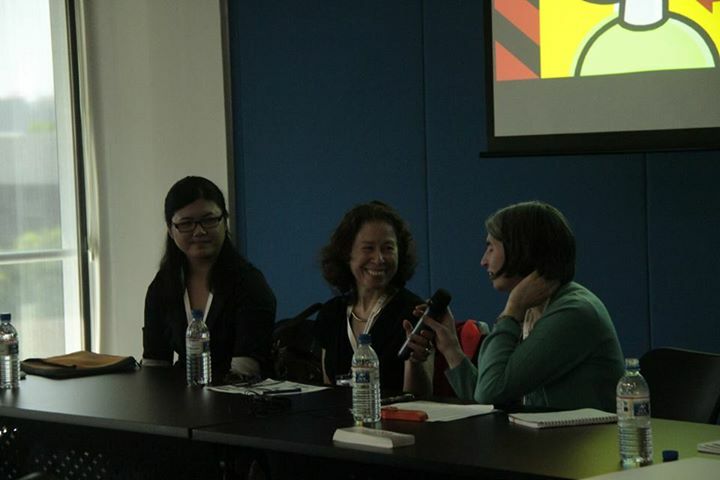 The day after that, I had my first panel discussion which was a great success. At the conclusion, I was approached by a journalist who wanted to do an interview with me and speak about parenting, self-esteem and my book. Was I nervous? For sure! But I took a deep breath, said yes, and did it. If you’d like to view the entire interview – lots about education in the US and in Singapore and the importance of building self-esteem in kids, please click here. 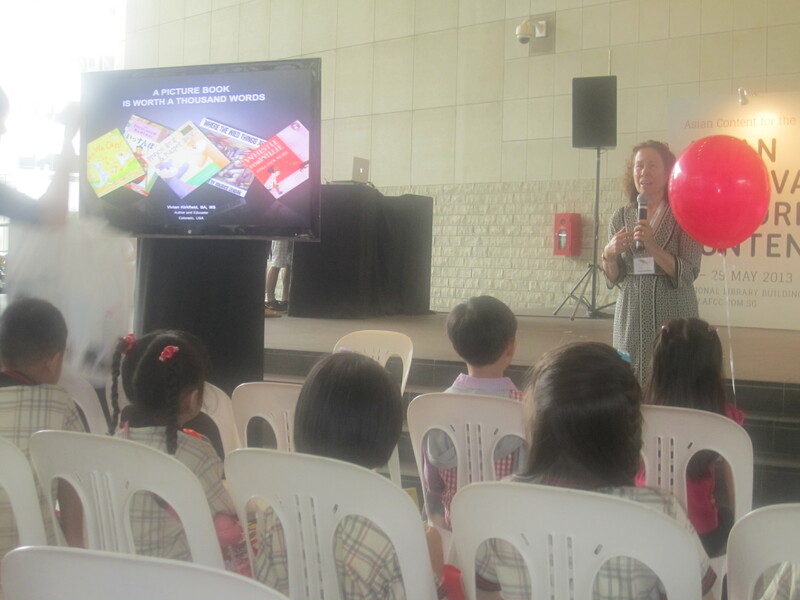 This entry was posted in #2013AFCC, Glossophobia, Monday Magic for Writers, Public Speaking and tagged anxiety, Communication, Glossophobia, Public speaking, Singapore by viviankirkfield. Bookmark the permalink. Good tips, Vivian. The more we whittle away at our fears, the more freedom we embrace. Great advice and gems here for all genres and all writers. Thanks Vivian! I plan to keep this one. 🙂 (You know, for when I finally publish… some day). As a former speech coach, when I was helping h.s. seniors prepare their formal Senior English speeches, in the final practice preparations I also had them recite the speech into a hand-held tape recorder. They listened to the tape and made notes: where did I hesitate? Were any of my words unclear? Are there effective places to pause and look at my audience? They would analyze, plan, and re-tape. Of the second taping (or the third) gave them the boost of confidence they needed. Glad it was helpful, Teresa! As you know I’ve had speaking engagements as an author as well so I can certainly relate to this. One thing for sure. Preparing a talk is time consuming and steals away time from writing the next book. But it makes money for you so I guess that way it is OK. Seems like preparation is so lengthy it often seems like I could have written another book in that time. And I’m still nervous! Glad the tips were helpful…and you are right, what we want to be doing is writing. :) Thanks for always being such an enthusiastic cheerleader!